Not sure what the best yarn swift is? We’ve done the hard work for you. Follow our advice and you’ll know what to look for when buying swifts, including the different types and features to look for when selecting the best yarn swift to meet your needs. Yarn swifts are so much fun! They come in so many different styles, materials and sizes that it can be pard to pick the right one. But you might also know what you want already. Before you buy a yarn swift, whether in a store or online, this article will help you determine the perfect yarn swift for you. Yarn swifts get you knitting faster. They hold hanks or skeins of yarn while you wind the yarn into cakes or balls. All yarn swifts work in the same way. They spin round and round while the yarn streams off in a single, untangled strand. But they come in a variety of styles, materials and sizes – each offering an efficient, labor saving method to wind your yarn. Why is a Yarn Swift a Good Investment? When you buy yarn in hanks or skeins, most yarn stores offer to wind it for you. While most of us accept their great offer, we probably shouldn’t unless we are going to cast-on as soon as that yarn cake comes off the ball winder. We know that having 1500 yards wound by someone else feels so good, but if you don’t use the yarn quickly, it loses its elasticity. When yarn has been wound too tight or for too long, what you knit doesn’t look as good because the natural movement of the yarn is gone. The same goes if you wind the yarn yourself. It doesn’t matter if you use your knees or someone’s arms, the back of a chair or your neck to wind your yarn. And let’s not forget the tangled mess of yarn you end up with when you try to knit directly from a hank! Having a yarn swift at home allows you to decide when you want to go from hank to ball or cake. It lets you determine how tight to wind the yarn. It puts you in control. Some yarn swifts also allow you to unwind balls and cakes of yarn, turning them back into hanks for storage. If you have yarn leftover from a project, this is a great way to protect your yarn from stretching before you find another project for it. Whether you want a cheap swift to just get-the-job-done or an heirloom quality swift to pass down to future generations, there are a few basic things you need to know to make the best buying decision. For the home knitter, the two most used yarn swift styles – umbrella and Amish (also called tabletop), work the best for all yarn weights. Additional styles include a combination umbrella and Amish style and a combination metal wheel and wood base. An umbrella yarn swift combines the properties of an umbrella – small when collapsed, push up ribs to open and pull down to close. These models use screw-in clamps that grip a surface, such as a tabletop, or have optional legs that sit on the floor. Working horizontally (parallel to a floor) or vertically, umbrella swifts adjust to the largest range of hank sizes. These swifts collapse for storing. 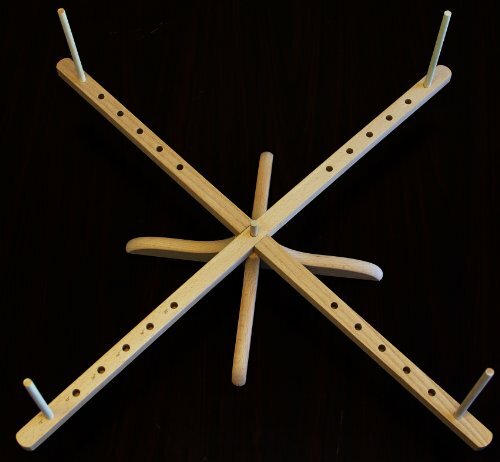 An Amish or tabletop swift works horizontally, has fewer parts than an umbrella swift, sits flat on a table, has pegs for sizing, and stores in shape or unassembled can be stored in pieces. Tabletop swifts adjust to a moderate range of sizes. A combination umbrella/tabletop style works horizontally, has few parts, sits flat on a table or the floor, uses diagonally placed wood for sizing, and stores in shape or needs to be disassembled for storing. These models do not adjust, but the diagonal placement of the wooden dowels provides a moderate range of sizing options. 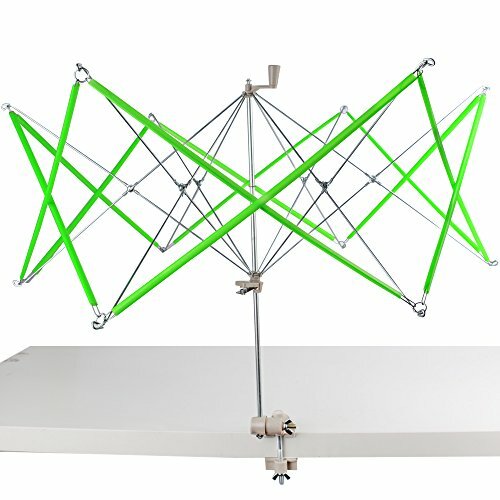 A combination metal wheel and wood base version works vertically, has few parts, sits flat on a table or the floor, uses metal supports for sizing, and stores in shape or has some parts to disassemble. This type of swift has a smaller range of adjustments for sizing. Traditionally made with long lasting hard woods, such as birch or maple, most of today’s yarn swift manufacturers use these same materials for both the umbrella and the Amish style swifts. You’ll find swifts with every part made from wood including clamps and screws. Some companies make umbrella swifts from plastic, metal, or a combination of these two materials. Additionally, others combine wood and metal. Personal preference, budget, usage, and design play a role in choosing the best material for you. When selecting the best yarn swift, you must think about size in two ways: how much space do you have to use and store the swift, and what size of hanks will you need turned into a ball. 1. Space to use: Umbrella yarn swifts can take up the most space when in use. For horizontal swifts with a left-to-right or vice versa movement, walls and furniture can get in the way. Some swifts expand to 8.5 feet in circumference. This means you need about 1.5 feet on either side of the center shaft for the swift to spin unencumbered. Want some more options for limited space when using a large umbrella swift? Clamp an umbrella swift on its side making a vertical swift. The top of a table chair can work well for this. On nice days, take your yarn outside and catch some rays. Clamp the umbrella swift onto a porch railing, a tree branch, a clothesline support, or a picnic table. When choosing a clamp on model, make sure you have a surface that fits the depth of the clamp. Some clamps open less than 2 inches, which may not be large enough to clamp the swift on some tables. 2. Space to store: If you choose an umbrella yarn swift, storage is a breeze – the ribs collapse neatly together and most brands come with a storage bag. If you choose a different type of swift, your storage options are more limited. 3. Size of swift: The size of swift you need depends on the size of the yarn hank you’re winding. And unfortunately, yarn hanks don’t come in just one size as each spinner, dyer, and manufacturer chooses the size based on their tools and methods. To determine which size swift you need, take a peek at your go-to yarn brands. Which yarn do you always like to knit? Cobweb or gossamer hanks come in a fairly small diameter. Indie dyers, working with DK or bulky yarn, go for big diameter hanks. But ultimately, you should choose the size of yarn swift that gives you the most bang for your buck so to speak. If you use a variety of yarn weights and hank sizes, choose a swift that gives you the most choices in diameters. If you usually use smaller weight yarns, which have less variety in hank sizes, then a swift with a smaller diameter expansion range might just do the trick. 4. Extra tip: If you use a ball winder along with your swift, you’ll need to consider how much yarn the winder will hold. Some winders hold as little as 4 ounces of yarn with larger ones holding up to 16 ounces or 1 pound of yarn. If your winder is on the small side and you have a large hank of yarn on your swift, you may need to cut your yarn during the winding and start a second yarn cake. Want a quality swift made for knitters of all levels? Made by a company that understands how important quality tools are for knitters, the Schacht Ultra Umbrella swift gets you knitting faster. No loud annoying squeaks when wood rotates around wood. No watching your swift slide across the table as the yarn spins off. No lost pegs. With an innovative design, this swift makes quick work of a tedious activity. For a longer lasting product that can be handed down as an heirloom, the Schacht Ultra Umbrella swift provides knitters with a tool they can count on again and again. 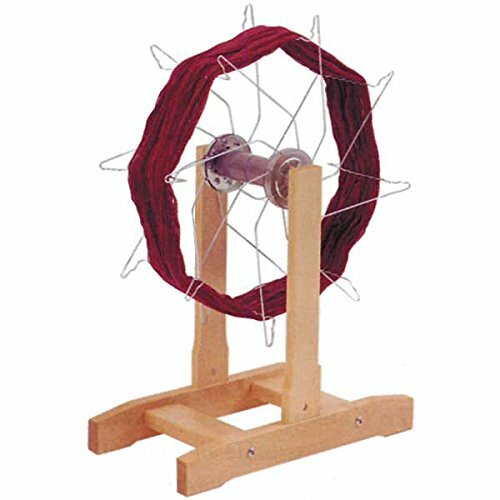 The unique design of this vertical yarn swift brings a bit of practical quirkiness to your knitting world. 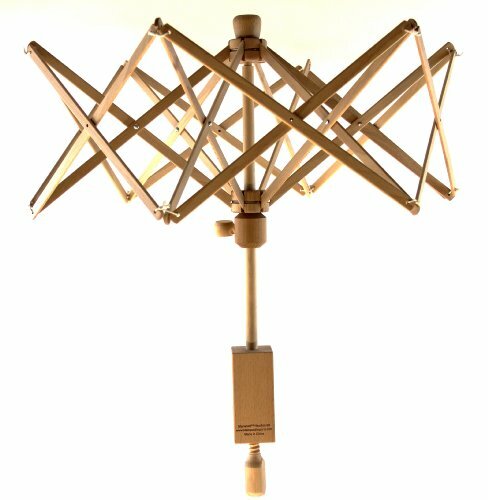 Made with a hardwood base and metal wheel, the Schacht’s Goko swift keeps yarn in place without tangling. Knitters using lightweight yarns value the way this swift holds the yarns for winding. Although the hank circumference size typically used on this swift has limitations, knitters find they use this swift not only for winding into cakes but also as a great tool for reskeining leftover yarn at the end of a project. 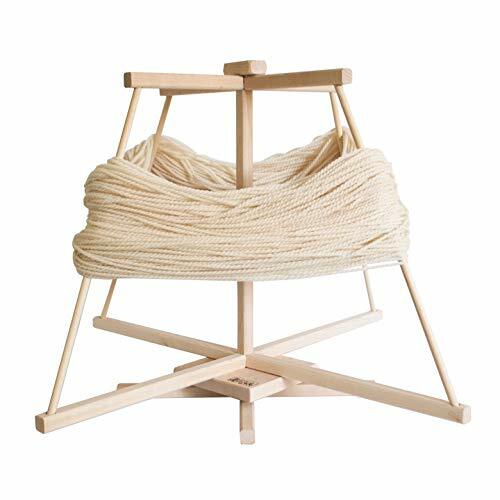 The classic style of this Stanwood Amish tabletop swift makes it a good general yarn swift. So simple to assemble and disassemble that even children can do it. This tabletop swift requires no tools, screws or clamps. Simply, interlock the base and arms and insert a central dowel. Reposition pegs in pre-drilled holes to hold the yarn. Wind yarn into a ball or cake or even knit directly from the swift. This simple and easy to use swift gets you knitting with minimal effort. Simple to set-up and use, the Beka swift works like functional art. 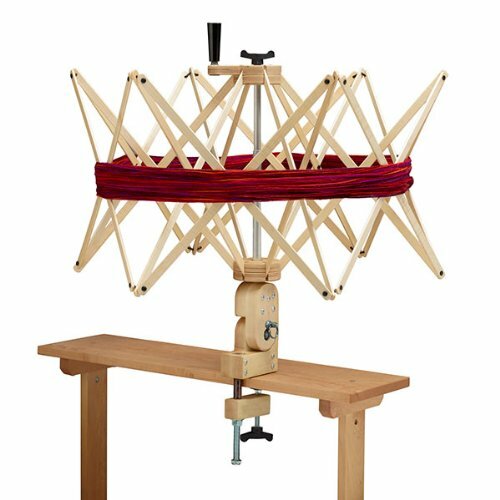 Made from hardwood, this tabletop swift gets you winding yarn in seconds. Untwist the yarn hank, place if over the swift, untie the hank, and start winding. No unwieldy ribs to push up or screws to tighten. Ball bearings at the central base keep this swift spinning fast and squeak free. No clamping or screwing to tables makes this swift a winner for any knitter with hand strength or mobility limitations. If you want an all wood umbrella swift, look no further than the Stanwood Umbrella swift. Sturdier than plastic and metal swifts, this swift clamps down tightly and wobbles less when spinning off the yarn. Knitters do find that over time the wood rotating on wood begins to make a loud noise, but a bit of beeswax or other solid wax appears to quiet this feature. With no pegs to go missing and easily collapsible ribs, this swift assembles quickly and folds up nice and tidy for storage. Budget conscious knitters looking for an umbrella swift may find the lightweight Cutehill Umbrella swift a good option. This metal and plastic swift does the job without fuss or fanfare. With no wooden parts to wear out, dry out, or soak up moisture, this swift works well inside your home, at a knitting club, or at the park. In addition to working as a horizontal swift, this swift easily converts to a vertical and angled swift by the turn of a wing nut, making reskeining easy. To collapse this swift for storage, simply pull the central lever all the way to the bottom of the center rod until the ribs lie flat against the rod. Of all the products reviewed, the Schacht Swift with Counter is our pick for the best yarn swift. Its price is at the high end, but the durability and features outweigh its competitors. Its ability to maintain an even tension means it won’t stretch yarn and projects will turn out better. Its quiet spinning, speed and ability to be used both horizontally and vertically make it a delight to work with. The counter makes it easy to know how much yarn is left in a skein. Compared to similar products, it won’t fall apart quickly, but should last to hand down to future generations, making it an excellent value for its price.